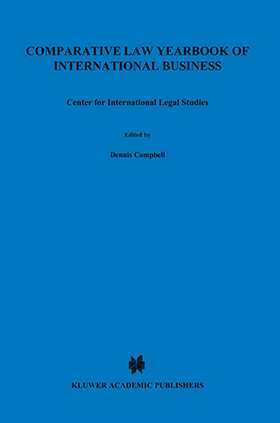 The twenty-third volume of the Comparative Law Yearbook of International Business contains chapters relating to agency and distribution, finance and investment, intellectual property, sports law, technology, and general commercial issues. The spread of jurisdictions treated includes Argentina, Canada, the Dominican Republic, Egypt, Italy, Panama, Portugal, Romania, Spain, Switzerland, the United States, and Venezuela. The range of subjects and jurisdictions in volume twenty-three attests to the diversity and scope of international business practice. General Editor, Dennis Campbell, Director of the Center for International Legal Studies in Salzburg, Austria, is assisted by a distinguished Board of Advisors drawn from leading academics and practitioners in Europe, North and South America, and the Far East.